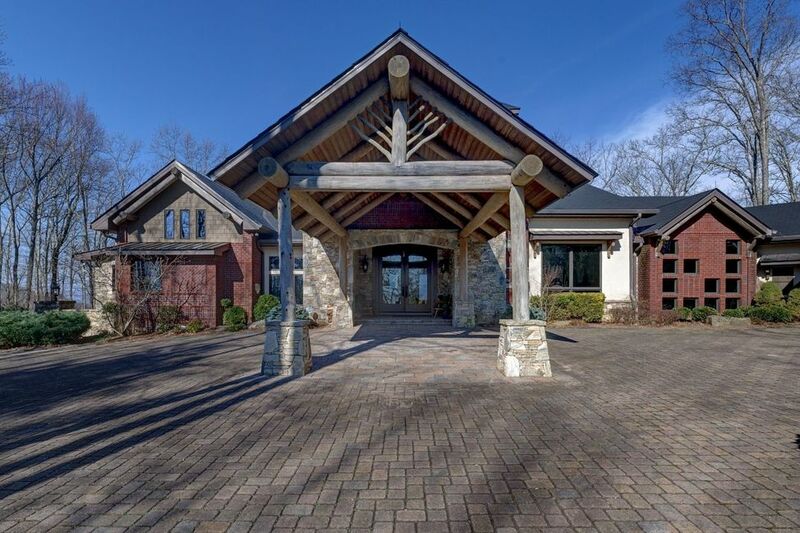 This Dillard GA home for sale is a magnificent retreat. The stunning custom home is located in the private, gated community of HeatherStone Tops. The 4 bedroom 6.5 bath home sits on a lot that is just over 4 acres in size. From exquisite finishes like hand-carved wood trim throughout the home and custom cabinetry in the kitchen. If you have been searching for a luxury mountain estate in the Southern Blue Ridge Mountains look no further. As one would expect from a luxury retreat the great room is marked by soaring ceilings and a wall of windows embracing sweeping mountain and golf course views. The floor to ceiling stacked stone fireplace opens to both the great room and the kitchen. While grand the home is at the same time comfortable. The gourmet kitchen has it all, including a large built-in refrigerator and freezer, a professional Wolf gas range, and an oversized custom island with seating. In addition there is a stunning formal dining room, a perfect spot for an elegant dinner party. The main level spacious master suite boasts custom wood built-ins, a fireplace, and spectacular views to the mountains. The large master bath with hand-cut marble soaking tub, walk-in shower, and expansive closet round out a luxurious place to retreat. The indoor swimming pool, covered deck with hot tub, and elevator are merely the icing on the cake. Contact our team at Berkshire Hathaway HomeServices Meadows Mountain Realty today to schedule a private showing of this Dillard Georgia property or any property in the Highlands NC area. We welcome the opportunity to help you complete a successful property search. Let our knowledge and experience serve as your guide to real estate in the Southern Blue Ridge Mountains, locating the ideal retreat for you and your family. Perhaps this Dillard GA Home For Sale is the one for you!